Castrol oil only. Coupon must be presented at time of purchase. Up to 5 quarts of Castrol oil. Does not include waste disposal. Plus tax and shop supplies. Not valid with any other offer. See dealership for details. Void where prohibited by law. If your Toyota is due for an oil change, don't settle for the standard quick engine lube. 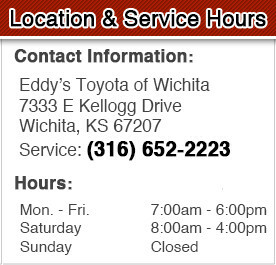 Print this coupon and get the complete Castrol synthetic oil change package for just $50.95 at Eddy's Toyota. In addition to replacing up to 5 quarts of your engine oil with synthetic motor oil, we'll replace your oil filter, inspect and adjust all your fluid levels, complete a multi-point inspection, and finish with a complimentary car wash and vacuum. With new synthetic oil, your engine will have the protection and lubrication it needs to continue working hard this weekend. We'll even perform this critical service for any make and model!